If you have a 'green freak' for a girlfriend, then your choices aren't many, when it comes to buying her eco friendly gifts. Hence, we have a list of eco friendly gifts for women, so that you can take your pick! Buying gifts for women is always a Herculean task for men. Not only are they very difficult to predict and hard to please, but their fussy nature makes it even more difficult for men to get a right gift for the woman in their lives. Sometimes, she may not seem happy even when you have spent your entire month's paycheck for her gift, whereas sometimes, her eyes may glitter at some cute, pretty but completely useless thing you bought from a roadside vendor while on your way home! Things become even more difficult when you have a woman with eccentric obsessions. Take for instance a woman who is so enthusiastic about environmental causes, that she refuses to eat anything that's not organic! In such case, buying a gift for her can be a real pain in 'you know where.' To relieve you of such tricky situation, we have compiled a list of some eco friendly gifts for women. Flowers are the most romantic choice when it comes to gifts for women. However, you cannot give any bunch of flowers to your ladylove, given her eco friendly preference. Hence, hunt for local florists in your area who specialize in organic flowers. Alternatively, you may also pluck some fresh flowers from your garden and make them into a handmade bouquet. Gifting a potted plant is also a great idea. Your woman is bound to love this adorable gift. Accessories made from recycled materials are a big hit among women these days. You can take your pick from the myriad handbags available in various shapes and sizes. The fabric for handbags comes from an array of materials like candy wrappers, bamboo, waste cartons, etc. There are some sites that particularly deal in recycled handbags. Thus, you can easily order one from any of these websites. This can also be a great option if you are looking for eco friendly gifts for mom. More on great gift ideas for mom. You will be spoiled for choice when you think about gifting handcrafted artifacts. Not only they are eco friendly, but the range in which they are available is simply mesmerizing. From nut shell bracelets to bamboo chopping boards, there are hundreds of items to choose from. However, you might have to hunt for shops that stock handcrafted artifacts. Although, these are more of a 'guy thing', your girlfriend will find it simply impossible to resist a cute solar powered torch or a lamp shade. If you wish to gift a conventional item like cell phone or i-pod you should also include a solar powered charger with it. It is very convenient to use while traveling and leaves no carbon footprint. These include candles that are 100% made from soy and bees wax. Additionally, the fragrance added is completely of biological origin. A global warming mug is also quite popular as a gift item for environment conscious people, as it depicts the fate of the world if we continue to ignore this issue. When you put hot beverage in it, the levels of the oceans rise and the polar ice begins to melt. Alternatively, you may also gift her clothes and shoes that are made from organic fibers. These days many designer brands are coming up with their eco friendly collections and they really make for awesome eco friendly gifts for her. More on eco friendly clothing. Eco friendly things or goods are those, that cause no harm or a minimal harm to our environment, when they are being produced or transported to the market. With global warming altering the temperature of our mother earth, making the sea levels rise, and risking the survival of humans living in lands close to the sea, it is our duty to switch to such products, which are environment friendly. Besides being environment conscious ourselves, we should also take steps to make other people aware about it and the best way to do it is through gifting them eco friendly products. Here is a list of some innovative eco friendly gifts for men. Men love to eat, that is why we have proverbs like, "a way to a man's heart is through his stomach". So one of the best eco friendly gifts for men can be a basket full of fruits. You can decorate this gift basket with beautiful flowers such as red roses or if you want it to be unique, you may decorate it with gladiolas. Read more on food gifts. One of the best eco friendly gifts for him can be things which are made from recycled products. There is a huge variety on the Internet to choose from. There are bowls made from old, recycled LP records, coffee mugs made from recycled old coke cans, college bags and wallets made from old newspapers, bracelets made from cycle chains, etc. Read more on good gifts for boyfriends. There are t-shirts which are available in the market today, made from recycled materials, which make very good eco friendly gifts for dad, considering he can do gardening, paint the house or just relax in them. These cotton shirts contain environment friendly slogans such as "Grow More Trees" or "Recycle Reuse Run" written on them. Read more on good gifts for dad. Most men are technology freaks, making a solar battery one of the most sought after eco friendly gifts for men. Some solar batteries available in the market are used to charge USB-compatible device. They have solar panels attached to them, which soak the sun's energy, charging the battery in the process. These batteries can be used to charge cell phones, digital cameras, MP3 players, etc. Yes, you heard it right. There is now a clock available in the market and also on the internet, which runs on a water powered battery. A clock is something which will be of great use as well as a great reminder of yours to the man it is meant to be gifted. Read more on perfect gift for him. A flashlight which does not use any battery and gets charged just by shaking, is another of the eco friendly gifts for men. Such flashlights contain an internal magnetic generator, which turns repetitive motion, created by shaking the flashlight, into electricity. This electricity is then stored in a capacitor and used for running the LED lamp. If your man likes adventure, then this flashlight can be of immense help during emergencies. A diary made from hand made paper or a bookmark made from the same, is the one of the best eco friendly gifts for men who love to read, write or pursue other intellectual pursuits. Wall hangings made from recyclable paper can also be gifted. Read more on homemade gifts for men. These were some creative ideas on eco friendly gifts for men. One last tip on buying gifts - Choose the gift according to the person's personality and liking, to make it memorable for him. When it comes to giving someone a gift, most people think about some of the obvious gifts like showpieces, electronic appliances, jewelry, ethttp://www.blogger.com/img/blank.gifc. Though people like such things, many a times these gifts lie in the corner of the house once the initial excitement dies down. Moreover, most of these gifts are products which are disposable and cannot be recycled which subsequently causes an adverse effect on the environment. Here, the green gifts act as a savior which are 100% environment friendly. These gifts are eco friendly, renewable as well as sustainable. However, most people think that there is no variety when ithttp://www.blogger.com/img/blank.gif comes to green gifts. Nevertheless, this is not true and rather, there are actually ample amount of green gift ideas that one can choose from. Here are some of the green gift ideas. 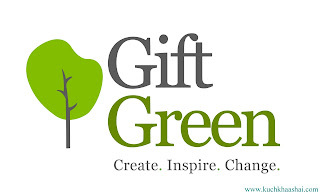 The best thing about green gift ideas is that it need not be something that is tangible. For instance, a poem or a letter can also be a good green gift idea. An important thing that you have to remember whhttp://www.blogger.com/img/blank.gifile choosing a green gift is that it should be something that the receiver would like and will be able to use. So, before choosing a particular gift, make sure that the gift matches with the interest of the receiver. With this note, let us take a look at a list of green gift ideas. Another green gift idea would be to gift some homemade gifts. If you are a good cook, you can prepare some food items for the person you are giving the gift to. Some of the things that you can add to your eco friendly food gifts are homemade cookies, jams, brownies, breads, dips, soups, etc. Once you have made these items, pack them in a bamboo basket and gift it to your loved one. If you are not very good at cooking, another thing that you can do is to gift some good organic wood. You can fill a large bamboo with organic vegetables, fruits, chocolate, wine and cheese. More on eco friendly gifts for women. If you are looking for some useful green gift ideas for men and women, but cannot find a good one, a gift certificate would be a good idea. If the individual who you want to give a gift to has been wanting to learn some new activity for a long time, giving him/her a gift certificate for that hobby class would be a fantastic idea. For instance, if your friend wants to learn guitar, give him a gift certificate of a guitar class where he can learn to play it. Apart from that you can give gifts like concert or movie tickets, gift certificate for a dinner at a good restaurant or a second hand book store. These are some of the good green gift ideas for him and her. Read more on eco friendly gifts for men. 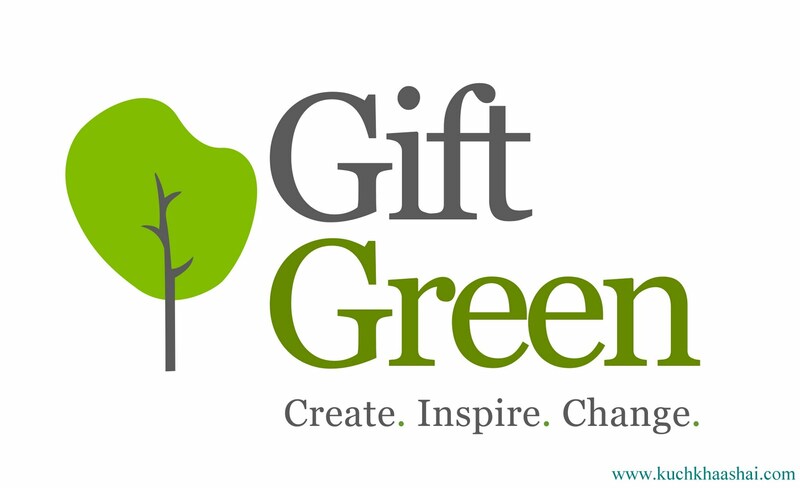 The best green gift would be gifting your time or service by doing something that person needs the most. If you want to give a gift to your parents or grandparents on their birthdays or anniversary, the best gift that you can give this is to spend a whole day with them. This gift would be of much more value than just sending an expensive gift. Other than that, cooking food for a person who is been ill for sometime or may be doing gardening work for a friend who is having a hard time managing home and work can also be a wonderful green gift. I hope this list of green gift ideas has helped you in choosing one for your loved one. Apart from these ideas, you can also come up with some more green gifts. The only thing you have to keep in mind before giving the gift is that it should be something that is useful for the receiver and does not cause any harm to the environment. Make your baby shower a unique, fun and memorable affair by including the below mentioned interesting scrapbook activities in it. Baby shower is an occasion wherein the parents of a newborn baby or who is about to be born are "showered" with gifts. Some couples, in order to celebrate their parenthood, throw a party or plan a cozy get-together with their near and dear ones, which are given the name of "baby showers". Till about recently, baby showers were like any other regular party with games, food, gifts etc. However now, the trend to make this a more emotional, close wound and memorable affair is fast catching up! Now, the couples are replacing the traditional baby shower games with involving the guests in making scrapbooks which have pictures of the newborn baby, the expecting mother and the father. These baby books are created with the idea that when the child grows up, he as well as the other family members can reminiscence the old times by looking at the scrapbook. If you too are planning to get your guests involved in this activity at the baby shower, you need to be first of all ready with the supplies, before the guests arrive. Ideally, a scrapbook which has a leather or cloth cover should be chosen as it looks formal, special, timeless and unlike the commonly used ones. A good baby scrapbook idea here would be to get the baby's initials as well as date of birth engraved on the cover of the scrapbook! Besides this, you would need pictures that you want to be included in the scrapbook, stickers, ribbons, buttons, printouts of some quotes on motherhood and children (you will find plenty of these on the Internet), cards (which the guests bring for you at the baby shower), and other decorative stuff such as patterned papers, that you think will add to the beauty of the baby shower scrapbook. Be ready with the supplies needed to carry on the work, such as scissors, colors, glue, pencils, markers, card stock paper and other stationery. Do not leave anything for the last moment and be prepared with everything in advance. Start the baby shower scrapbook by writing about those moments when you two were excited and at the same time, nervous about becoming parents. In this section, both the partners can write their feelings, fears, anticipation and happiness about the birth of their baby. The letter from the doctor confirming the pregnancy as well as ultrasound photographs can be included in the next few pages. Some incidents that are wroth mentioning are about the mother's food cravings and mood swings. They will be great to add some humor to the scrapbook. These can be posted along with monthly pictures of the mother's growing tummy. Pictures of the time of delivery, when you two were at the hospital, pictures of the nurses and doctors who helped in the delivery, letter confirming the birth given by the doctor, the baby's weight and height at the time of birth, baby's time and date of birth, the color of his eyes, the color of his hair, his foot and hand imprints - these are the things that you should include in the scrapbook as they make for valuable memories. An interesting baby book idea is to include all the pictures of the baby's firsts like his first smile, his first walk, his first teeth, his first bath, first hair cut, first outside trip, etc. Devote the last section of the scrapbook to the entire baby shower event. Click the photographs of the baby shower decorations, guests, food menu, gifts and cards received from the invitees, baby shower cake etc. and have them posted then and there in the scrapbook by all your invitees. One of the unique baby shower scrapbook ideas that you can consider is to paste the party invitation on the cover of the scrapbook, along with some of the cards and gifts received as they will make the cover look very attractive! While conducting this activity, explain the general layout to the guests, however, at the same time, give some pages to them to design in whichever way they want. They can write some blessings for the baby and the mother or draw something funny which the child can enjoy when he grows up and sees! In other words, give the guests freedom to design and decorate some pages according to their wish! This will add abundance of creativity to your baby shower scrapbook! Diaper cake can be a fantastic gift for an expecting mother. Baby shower diaper cake is a perfect idea because it can be used as a decorative centerpiece for any baby shower and is also easy on the pocketbook. Easy to make, you can always experiment with shape, themes and sizes to create an attractive and unique look. First, take a long, colorful, narrow ribbon and cut it into 1 foot lengths. Now, roll up each diaper and tie it with the section of 1 foot ribbon. Start forming the layers of the diaper cake. Use a baby bottle for creating the centre of the first layer. Now attach other six rolled up and tied diapers to it. Use the ribbon to tie them around the bottle. Make sure you tie them tightly. Now create the second layer with 15 diapers adopting the same method as mentioned above. 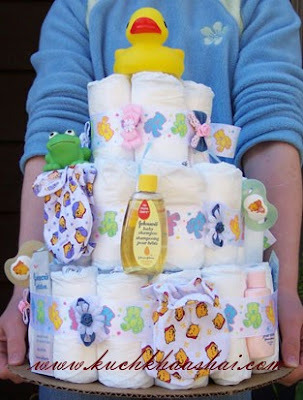 However, for this layer you will not use a baby bottle, instead use few of the 15 diapers to form the inner tier and then attach the rest of the diapers to it with the ribbon. For third layer use 27 diapers and follow the same instructions as above. Once your three-tier diaper cake is finished, place some adhesive tape on the platter where the first cake tier is positioned and attach it. Place the second layer on the bottom tier and then attach with tape. Similarly assemble the third tier on the second tier and attach with tape. Make sure you end with the smallest tier. Now give finishing touch to the diaper cake. Stuff it with baby keepsake items. You can tuck the items inside the ribbon that is around each tier. In case you fall short of ribbon, you can use more ribbons to ensure they are secure. 1. Always prefer using larger size diapers because they allow the mom to use the diaper cakes longer. 2. The number of diapers used in each layer may vary depending on the brand of diaper and how tight you wrap them. 3. 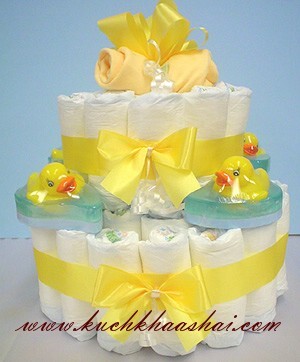 You can also use cloth diapers for making the cake.